Bristol's Colston Hall has been through four incarnations and has twice been destroyed by fire. The first Hall was built on the site of a former 13th century Carmelite Friary which was subsequently replaced by a mansion known as the Great House. Edward Colston purchased this house in 1707 and founded a boys school there that was named after him, the school however moved out of the building in 1857 and a Company called the Colston Hall Company bought the site in 1861. 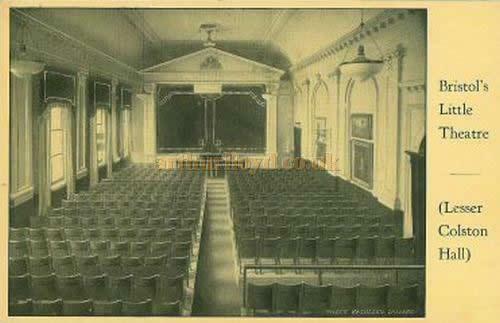 Subsequently the first Colston Hall was opened to the public on the 20th of September 1867. 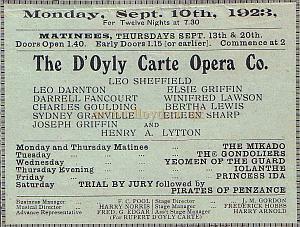 Right - Programme detail for a production of the D'Oyly Carte Opera Company performing at the Colston Hall, Bristol in September 1923. On the morning of the 1st of September 1898 a Clarks clothing factory nearby caught fire and the flames spread to the Colston Hall, all that remained after the fire was put out were the Hall's walls and pillars. 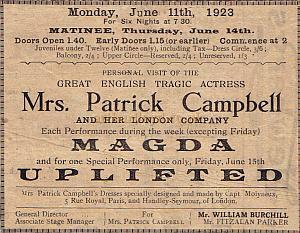 Left - Programme detail for a production of 'Magda and Uplifted' with Mrs. Patrick Campbell at the Colston Hall, Bristol in June 1923. The building was then rebuilt and this second Colston Hall was opened in 1901. In 1919 the Hall was sold for the sum of £65,000 to the Bristol Corporation who, now known as the City Council, continue to manage the building today. In 1935 the pianist Rachmaninov performed there. Not long after this the Hall was closed for remodelling to provide better site-lines and it was then reopened in December 1936. 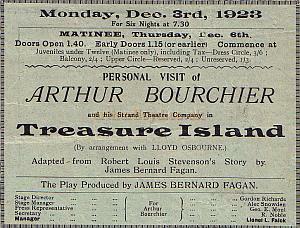 Right - Programme detail for a production of 'Treasure Island' with Arthur Bourchier at the Colston Hall, Bristol in December 1923. The Colston Hall was however rebuilt again and reopened in 1951 to mark the Festival of Britain. The rebuild was carried out to the designs of the architect Sydney Gerald Howitt L.R.I.B.A. Howitt was employed by Bristol Corporation in the early 1950s for this project, he had been trained by his father's Cousin, Thomas Cecil Howitt, who was well known for designing the Town Hall in the centre of Nottingham. Strangely after the new auditorium was finally opened a Mr Singer, who was Sydney Howitt's section head, claimed all the credit, I'm told that his is the name mentioned on the Hall's Foundation Stone instead of Sydney Howitt's. 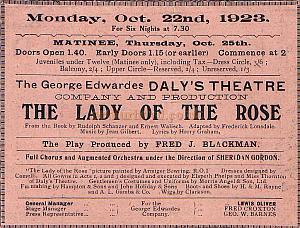 Left - Programme detail for the Daly's Theatre production of 'The Lady of the Rose' at the Colston Hall, Bristol in October 1923. It was here that the Beatles made an early performance whilst supporting the Tommy Roe and Chris Montez tour on march the 15th 1963. The Colston Hall has since been host to a great variety of productions from The Dave Brubeck Quartet to Jimi Hendrix, The Rolling Stones, Van Morrison, and Bob Dylan, and after a major refit in the early 1990s continues to be a popular venue with both artists and audiences alike. 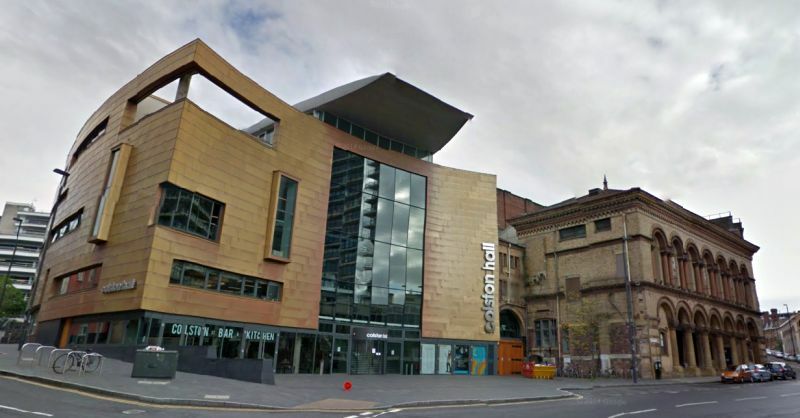 The Colston Hall today is a Grade II Listed Building which had a multi-million pound extension that opened in 2009. There are some interesting programmes for the Colston Hall here. Some of the above information on the Colston Hall was kindly sent in by Dave Baxter and Richard Howitt. You may like to visit the Colston Hall's own Website here. Above - The auditorium and stage of Bristol's Little Theatre (Lesser Colston Hall) - From a Postcard sent in 1928. Bristols Little Theatre was a producing house with a resident company called the Rapier Players. The first production seems to have been in 1923 but this seems to have been in a makeshift space and the purpose built Theatre was not created until a later period. The Old Vic theatre company, Bristol also used this space until the New Vic was built. The council sadly closed this part of the Colston Hall Complex in the 1980s and remodelled it into a bar for the main hall. Some of the above information on the Little Theatre was kindly sent in by Dave Baxter. Is the company an amateur one? - No: all the members of the company are professionals, and have had considerable stage experience. The local Press has on very many occasions spoken most highly of their work in Bristol's "Little" Theatre. Right - Programme for the Bristol Little Theatre's production of 'The Return of the Prodigal' at the Colston Hall, Bristol in April 1924. If the venture is a financial success, what will happen to the profit? - The Executive Council consists of honorary officials, who are making nothing out of the venture, nor do they intend to do so. Any profit will be devoted to the furtherance of the repertory movement in our city. Is the theatre actually a theatre, or is it merely a "fit-up"? - It is a theatre. The Colston Hall Committee of the Corporation must be congratulated on their vision and enterprise. The stage and proscenium are permanent fixtures, as is also the stage lighting. The seating is new, and the hall has been redecorated. Every seat is bookable in advance, and patrons can see and hear from every part of the theatre. Is the theatre entirely filled by subscribers? -No. The Council made a special point of this, so that the capacity of the theatre should not be filled by subscribers, and that there should be plenty of seats available to other members of the public. During the first three nights of the week there are many seats available. For the rest of the week the house is extremely well patronised, and as a matter of fact on many Friday and Saturday nights people have been turned away, and the "house full" boards exhibited. Subscribers are being specially asked, where it is immaterial what night they visit the Theatre, to do so in the early part of the week. 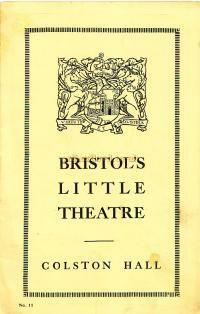 The above text on the Little Theatre was first published in the Bristol Evening News and is from a programme for Bristol's Little Theatre of 1924.